Hello! It’s been too long. Sorry. Life doesn’t seem to want to slow down. This will be a quick update about the past month or so. 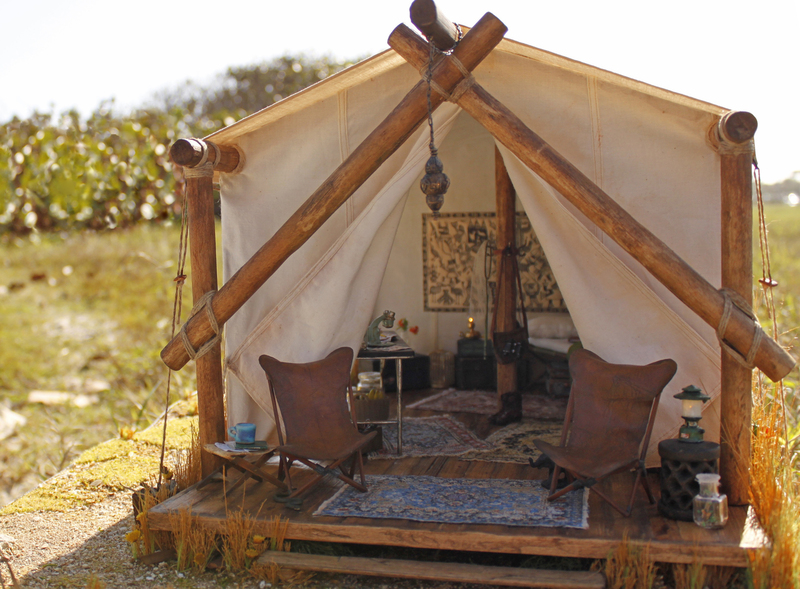 First, which some of you probably know, my little tent won 3rd place in the Creatin Contest! You guys, I about died. There is so much amazing talent represented in the entries. I would hate to be a judge. Congratulations to everyone who entered! So much time and love were poured into their projects and it shows. The 2017 kit is still sitting and waiting for some love. I think I’ve finally hit on the idea that I want to go with, but that’s for another time. I’ve been keeping myself busy with little embroidery and sewing projects. 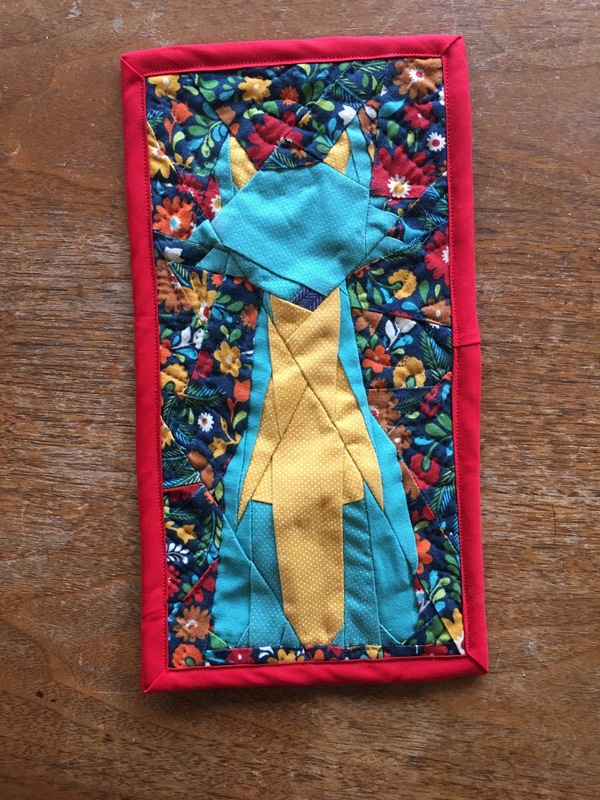 I tried paper pieced quilting. I made the fox for my grandmother and Twilight Sparkle was for my sister. I prefer paper piecing to traditional quilting. 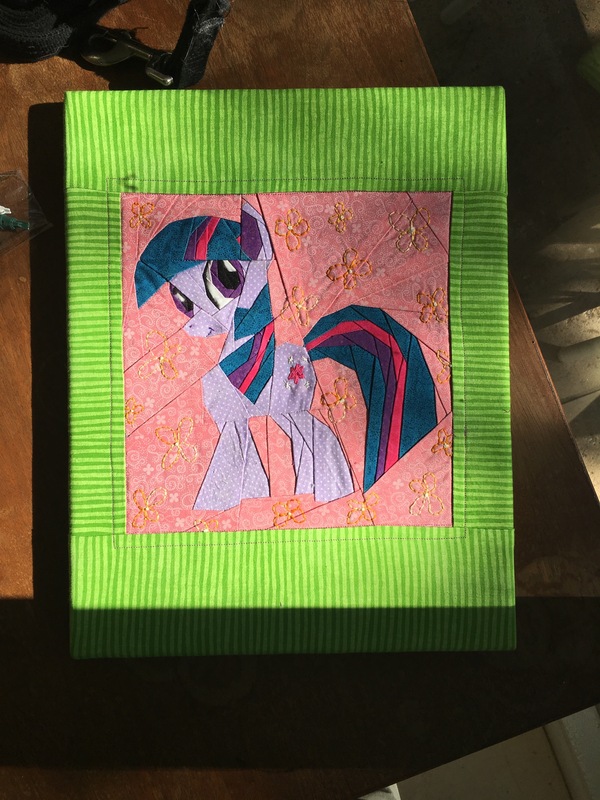 It is finicky, but I don’t have the patience for the precision of traditional quilts. I’ve signed up for a Labyrinth “quilt-a-long”. Each week there is an option for a paper pieced quilt block or an embroidery one. I’ve been doing the embroidered choice. I’m not sure how many blocks have been released so far, but I know it’s more than the 2 that I’ve gotten done. 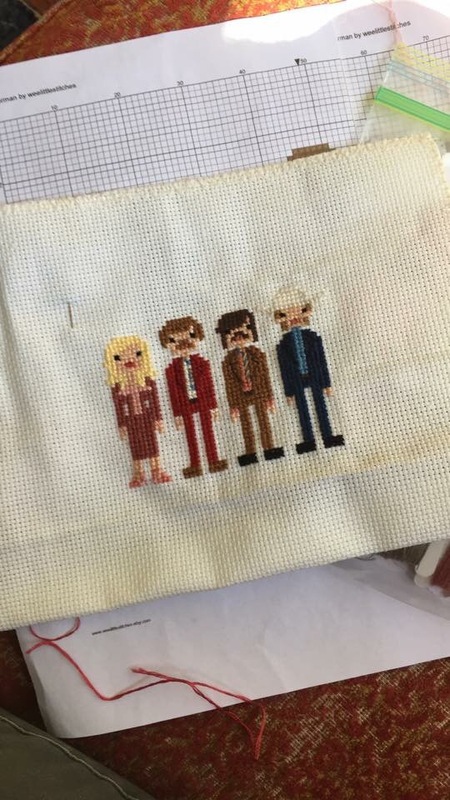 This is a cross stitch of the Anchorman cast I made for my husband. It’s done and framed now. It was my first counted cross stitch. I’m glad I started with something simple. It’s amazing how one miscount can throw off everything. I also signed up for a Valentine card exchange and a craft exchange. 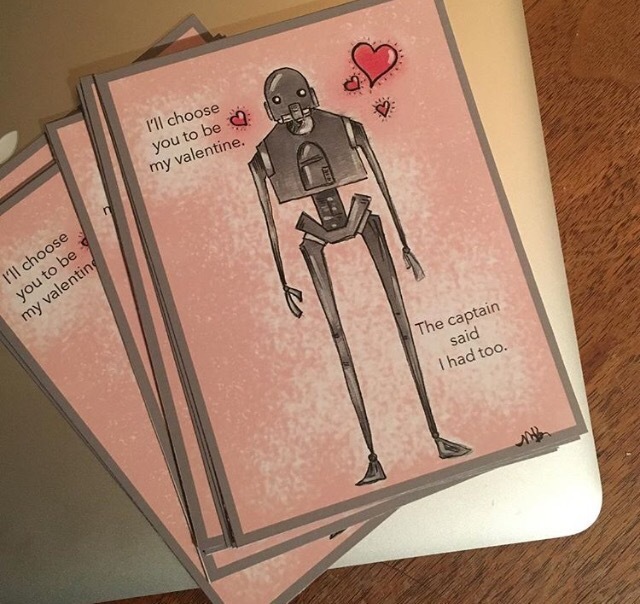 My Valentine card was distinctly geeky. I loved K-2SO from Rogue One. 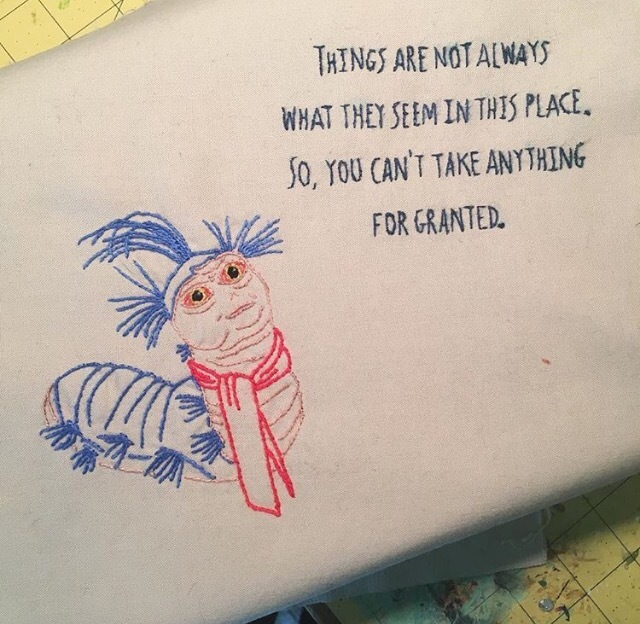 This is for the craft exchange. 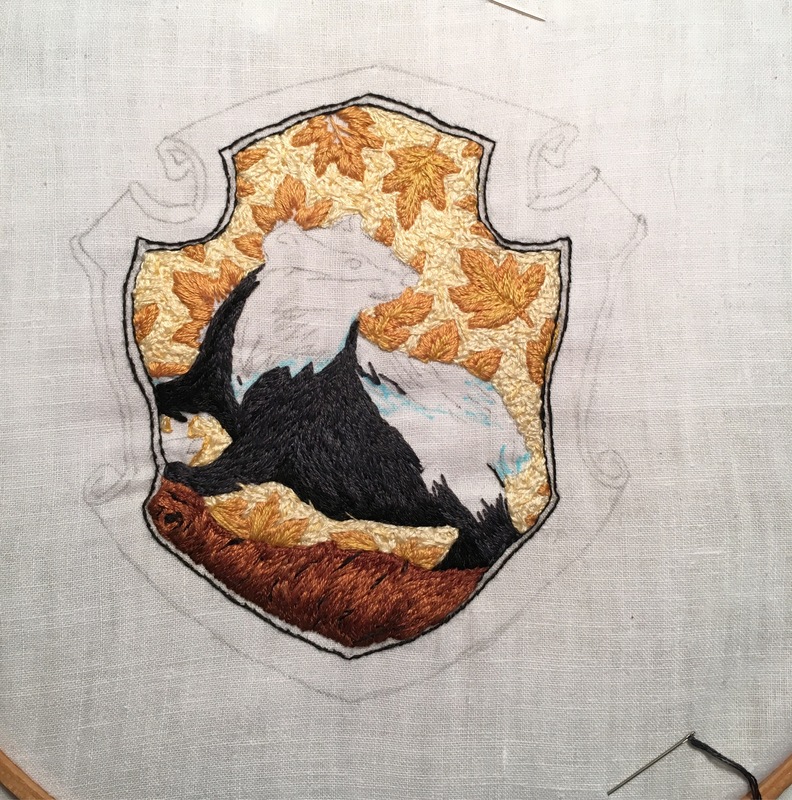 It’s a version of the Hufflepuff house crest from Harry Potter. Yes, I also like Harry Potter. I’m a bit of a geek. This has to be done and mailed before the 23rd. It’s coming along quickly, as long as I can devote hours to it. It will end up being framed. I figured if it’s behind glass it will be harder to see my mistakes (I’m just kind of making things up as I go along). My middle child turned 11. 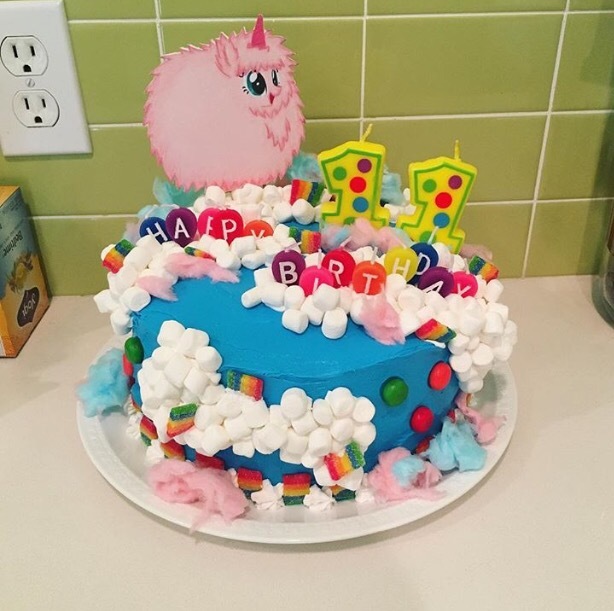 He didn’t know what theme he wanted for his cake. So, I got to choose. My two youngest love listening to crazy songs that get stuck in your head for years. One of those songs is called Pink Fluffy Unicorns Dancing on Rainbows. Being the awesome mom that I am, I knew that had to be the theme. He loved it! So, as you can see I’ve just been doing what ever peaks my interest. 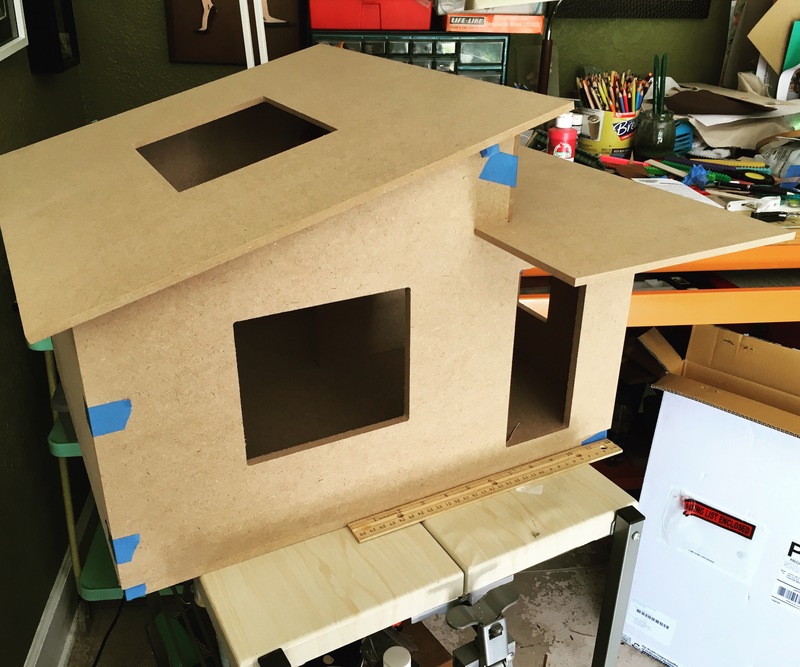 It’s been my way of recovering from dollhouse burnout. However, I’m starting to get the mini-itch again. Now that my idea is taking root, I’m wanting to get started. Oh, also, we have a new family member. His name is Bill Furry and is a ball of energy. 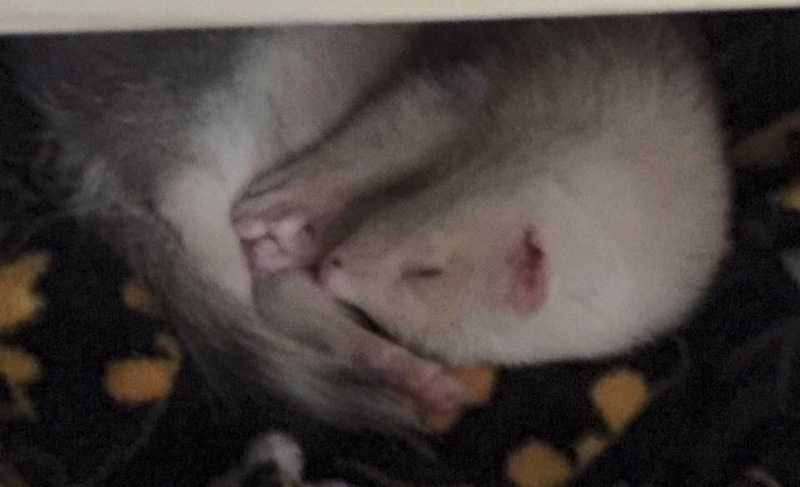 The only way I can get a picture of him is if he is sleeping. He’s so very helpful in making sure my trash can in the art room is empty. And he’s decided to help relocate some of my supplies. 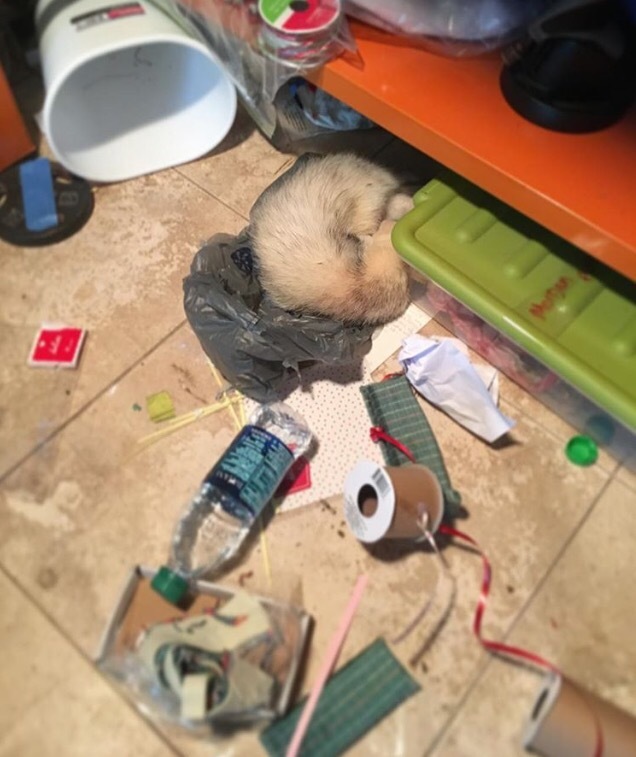 Thankfully, he’s not very good at hiding them yet. Emptying trash cans is tiring work. I think that about sums up the past month or so. Now that mini-ideas are starting to percolate again, I’ll be posting more often. Until then, hope you are having a fantastic March. I am ssoooooo HAPPY for you Morgan! CONGRATULATIONS on your 3rd place HBS WIN!!!! Thank you so much! It was such a wonderful surprise! Thank you! It was such a surprise! So much talent submitted this year! I would have hated to be a judge. P.S. Bill Furry is adorable! Thank you! We are really enjoying Bill. He’s such a funny little guy. Congrats!!! 😀 I love the Hufflepuff needlework especially. So many creative endeavors.